Some people think that cats are just cats, and that they are all the same. 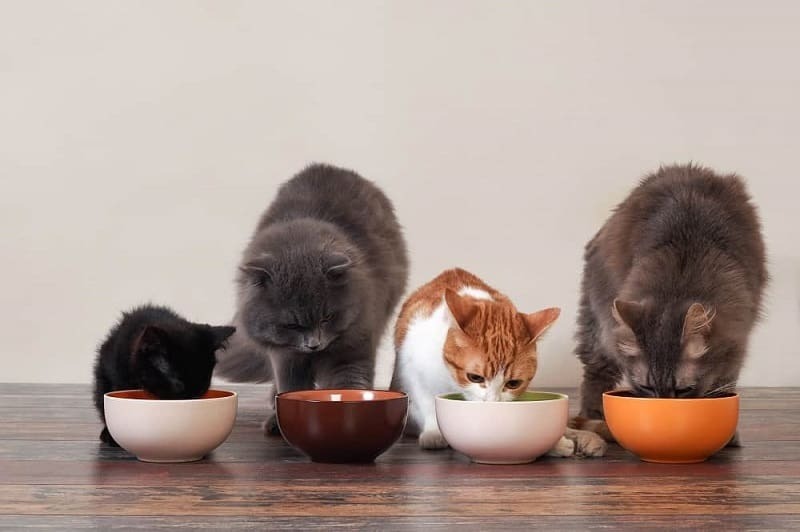 Those same people might be surprised to learn that there are dozens of different cat breeds, and each of them has its own specific traits, both in appearance and personality. Today we are going to take a look at 47 of our favorite cat breeds, and tell you a little bit about each one. This is a highly energetic cat that has the appearance of an Egyptian cat. It is not necessarily a lap cat, as it is very active, and it loves to climb to the highest points possible. This is a cat that is always on alert. The American Bobtail may look like a wild cat, but it is actually a very friendly and playful breed. These cats love attention from their humans, and will not hesitate to let you know when they want to play. Here is a cat that has absolutely adorable, curly ears. This is a breed that is known to be very affectionate, and they thrive on attention. They love their people, and they are also good with other animals. This cat has a curly coat that is low-maintenance. They are calm and friendly, and love to play without being too hyperactive. This is a cat that wants attention, but isn’t going to be demanding about it. These cats are named for dancers, because they are so lithe and graceful. They are also extremely affectionate, and will follow you from room to room. They also love to talk, a lot, and are very devoted. If you want an exotic looking cat, the Bengal is perfect. They have the look of a wild, jungle cat, but they are extremely loving. They do have a lot of energy, and are highly intelligent so they are easily trained. Here is a beauty that was once worshipped in temples in Burma. Not only is it beautiful, the Birman is also one of the sweetest and gentlest breeds you will ever have the pleasure of owning (or them owning you). Who says black cats are bad luck? The Bombay is black and beautiful, and incredibly affectionate. They love everyone, including children, and will follow their people around to get the attention they desire. This adorable, round-faced cat kind of looks like a small teddy bear, and is Britain’s most popular feline. This is a cat with a sweet and gentle disposition, and gets along well with people and other animals. A mix of the Burmese and the Chinchilla Persian, this cat has a playful and sociable temperament, and is quiet and easy going at the same time. This is a cat that is playful and laid back all at once. This is a well-mannered cat that is sweet and quiet, and loves to be affectionate. It is also known to be an excellent mouser. It loves to relax, but it also loves some good play sessions with its people. This is a cat that is fast and fearless, and will always keep you on your toes. This is also a very intelligent cat, and it will have no problem finding the most out of the way spots to hide and play. Here is a cat that is very affectionate, and very sensitive. It also loves to talk, and let you know exactly how it is feeling as it follows you around the house, waiting to be pampered and talked to. The Cornish Rex is slim and graceful, and has a gorgeous curly coat. It loves to play, and has an abundance of energy. This is also a very intelligent cat that can be trained to do a few tricks, including opening doors. This is basically a long-haired Manx. It generally has no tail, and a stocky body. This is a cat that is playful and loves affection, but can also be quite independent at the same time. It is also very territorial. The short wavy coat, big ears, and big eyes make this cat very recognizable. This is a cat with tons of energy, and it is very dexterous. It can jump and climb like nobody’s business, and it loves people. This is a hairless cat that loves people, whether it knows them or not, but is particularly affectionate with what it considers to be its people. It is very curious, and very affectionate, and wants to be loved. Here is a cat that can adapt to just about any situation, and is happy as an indoor or outdoor cat. It is an excellent hunter, and will likely bring you back presents after each hunting trip. This cat has the facial features of a Persian, but not the long hair so it isn’t nearly as high-maintenance. It is easy going and affectionate, while being playful and active at the same time. Here is a cat that absolutely thrives on love and affection, and wants as much attention as you can possibly give. He loves to watch everything you do, and will constantly try to get your attention for cuddles. This is a very large cat with wild cat roots, but is a comical house pet with a great personality. This can be a bit of a goofball, and it loves to show off. This is a cat that loves people, even children. This is the best of both worlds, a combination of the Siamese and the Persian. It is an absolutely gorgeous cat, with the gentleness of the Persian and the playfulness of Siamese cat, and it is very affectionate. Here is a highly confident cat that gets along well with other people and animals, and it loves to talk. Because it is so confident, it can easily be left to its own devices for a few hours without getting lonely. This beautiful cat is pure white, with odd colored eyes, one gold and one blue. This is a rare breed, and one of the most social and devoted cats you will ever meet, and it loves to get lots of attention. This small cat is a little ball of energy, and loves lots of play time with its humans. It love to sleep on its back, and oddly enough, enjoys being on a trampoline. It has short, stubby legs, and curled ears. This is a cat that wants to be the center of attention, at all times. It is highly intelligent, and has a huge vocal range that it is not afraid to use at any time to get the attention it expects and demands. This bobtailed cat has the look of a wild cat, and loves a rough and tumble lifestyle. It even likes to go swimming. It is gentle and loving, and loves most people. It even gets along well with other pets. Here is a tiny, short cat that is so adorable, with Munchkin and Selkirk Rex roots that give it a sweet and loving disposition. This is the ideal blend of both breeds, and it is one of the cutest cats you will ever see. The name suits this cat with curly fur, and it is as cuddly as it is cute. This is actually an extremely affectionate cat that will tune into your emotions and comfort you when you need it. This is one of the larger housecat breeds, and one of the oldest breeds originating in the US. This is a rugged, strong cat that has water-repellant fur. It is highly affectionate, and loves lots of cuddles. Here is another cat with no tail, and that isn’t its only strange characteristic. This is a cat that is very protective of its home, and its people. It is also the most dog-like of all the cats, and loves to play fetch. This is a miniature cat that has extremely short legs, and the body is mostly hairless. This is a very unique little cat that is small in size, but huge in personality. It loves affection, and is highly intelligent. This is a tiny cat with a huge heart, and is social with just about everyone. It even loves to be picked up, when not being cuddled, is a little ball of energy that loves to be active and play a lot. Here is a cat that acts as distinguished as it looks. It is affectionate, but reserves its love for a very select group of people, usually just its owners. This is a quiet and low-maintenance cat that is very sensitive. This is a strong and muscular cat that has one of the sweetest dispositions. It is very affectionate and even nurturing, and loves everyone it meets, even kids. It also has a lot of energy, and love to play. This cat looks wild and exotic, but it is actually one of the sweetest breeds. This cat has no wild DNA, and is overly friendly at most times. You can even train it to go for walks on a leash. This blue-eyed beauty can be is probably one of the rarest cat breeds you will find. It does love attention, and it is absolutely gorgeous. If you can find one of these hard to get cats, it is definitely meant to be. Here is a cat that will do just about anything to get the attention it craves. It loves belly rubs, and loves to talk until you finally talk back. If you want a companion, this is definitely the cat for you. This is the most popular cat breed, for its beauty, and for its awesome personality. This is a relaxed and good natured cat, but it does require a lot of maintenance because of its long, lustrous coat. This is another hairless cat that is highly intelligent, and very devoted to its people. It loves lots of affection, and wants plenty of cuddles and play time. This is another cat that loves to talk. Here is a smart cat that can even learn to understand a few human words, and it can be leash trained to go for walks. This is another cat breed that has a personality similar to that of a dog. This big fluffy kitty can be carried around like a ragdoll, hence the name. It is laid back and mellow, and loves attention from just about everyone. It will follow you from room to room just to be near you. Here is a quiet and gentle cat that is an introvert and shy near strangers. It also doesn’t like large crowds or a lot of noise. But, it does love the humans it lives with, and is very affectionate. Here is a cat that has it all: beauty, intelligence, and grace. This is an athletic cat that has plenty of energy, and it can be trained to walk on a leash. It can jump as high as eight feet, straight up. You can’t help but fall in love with those big eyes and folded ears. This is an adorable little cat that is sweet and gentle, and loves everyone. It will be playful for most of its life, and loves to pose for photos. This is a cat with a thick, plush coat that is curly and soft. It is playful and affectionate, but is also very calm and mellow. It loves people, and gets along well with other pets. This list is just a subjective list from some group of people and of course, the choices of the top and best breeds would still be up to you.